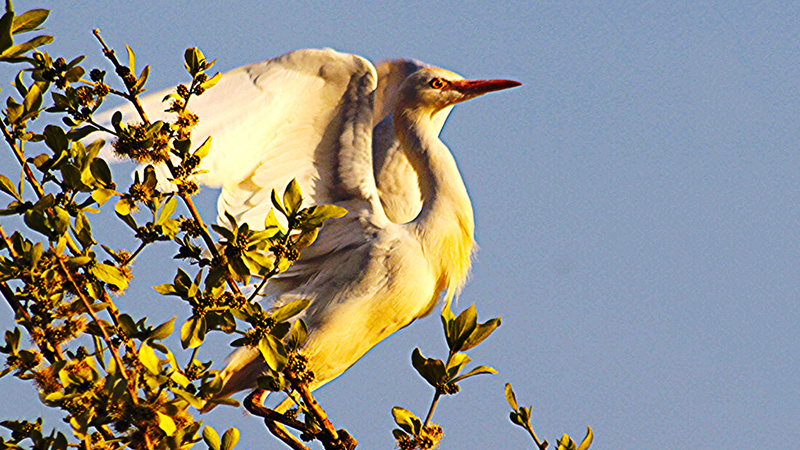 Cattle Egrets move about with large animals, the type that we as Field guides get lyrical about. They are particularly fond of walking a few paces behind a group of buffalo or other large mammals, eating the grasshoppers, caterpillars and other hapless insects the herd may kick up. They are very weary of humans though and will fly up and perch at a safe distance from us at the slightest hint of approaching danger. This helps us to indicate where precisely we must look to view these great beasts! Now this is all good and well, but why do we need to look for birds when clearly after big game? The simple answer is that most animals in Africa, from the majestic elephant to a minute Musk shrew have predators. To give a competitive chance in survival of the species, Mother Nature decided on camouflage. Therefore, we need all the help we can get! If it comes in the form of a few Cattle Egrets to show us where the big guys are, we will take it thank you! As dusk approaches the Cattle Egret flock will leave their hosts and fly off to their roosts near the river. There they will, drink, gather for the night and rest until the morning sun brings a new day.